With half as much sound output as any similar instrument, you’ll hardly notice this new assistant. That is, until it races through run cycles at up to 150,000 RPM (2,500 revolutions per second). You’ll also notice the easy-to-read full-color touchscreen–from across the lab or across the building--via remote monitoring and control. With so many big features built into this small ultracentrifuge, you’ll get more work done than you ever thought possible. The Optima MAX-XP’s rotors and its labware are designed, manufactured and tested as an integrated system for optimal performance and safety. The advanced software supports rigorous electronic recordkeeping with password-controlled access and audit trail documentation. The system monitors and records individual user and run data, rotor logs and more. Also features real-time speeds, time and temperature, and a customizable user interface for up to 12 persons. Plus access to an array of language, including French, Spanish, Japanese, simplified Chinese and more. The MAX-XP is ideal for applications requiring high speed and g-forces with volume flexibility, like viral vector gene delivery and nanoparticle applications. It also meets the needs of traditional laboratory applications, including separation of subcellular particles and protein purification and isolation. It’s fully compatible with our complete library of fixed-angle, swinging-bucket and unique near-vertical-tube (NVT) tabletop rotors. 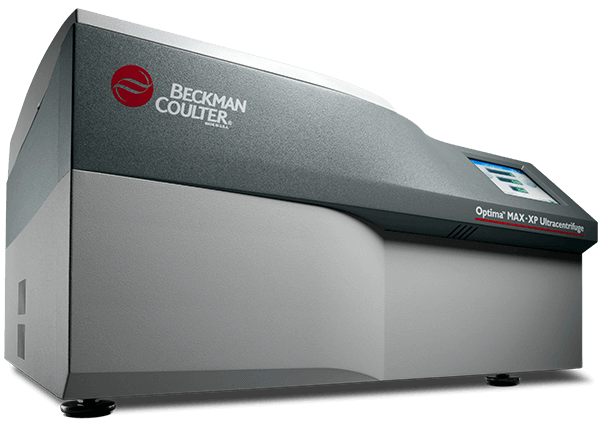 An ultracentrifuge is capable of separating high-molecular-weight compounds, viruses and subcellular particles for study.